carlo scarpa’s tomba brion (san vito d’altivole, 1970-72) and aldo rossi’s san cataldo cemetery (modena, 1971, 1978-84) were both designed for sites the veneto area in the early 1970s. the similarities and differences between both works highlight some of the tensions between neighborhood and metropolis [a polarity borrowed from alexander d’hoogue]. the fact that brion is in a small rural town and modena is in the periphery of a busy urban environment is almost incidental. brion itself is a neighborhood, and modena is a city. both projects are adjacent to an older cemetery, and react to this relationship by both contrast and analogy. scarpa designed two ways thresholds to brion: one allows for the private experience of the individual, and the other is accessed through the public cemetery, presenting the tomb entry as one of the cemetery’s various mausoleums. within the ‘public’ realm of the cemetary, brion blends in with the context, but establishes a point of entry and separation for the private realm. in this way it establishes a ‘neighborhood’ type of separation between public and private: friendly but clear. 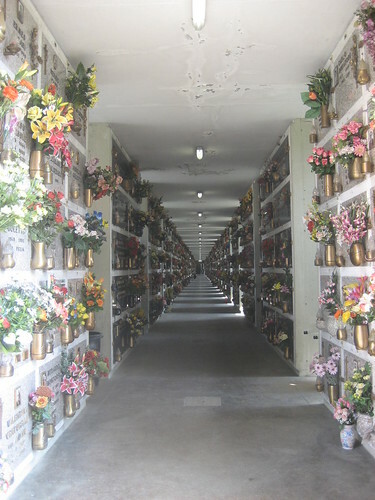 in contrast, rossi’s cemetary is contextualized through a metropolitan strategy. 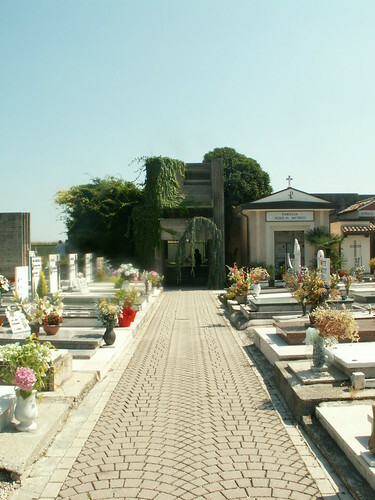 the new cemetery addresses the old (cesare costa’s project of 1858-1876) through its proximity and the use of similar scale and proportions. the strongest difference between both projects is that of ownership. brion is a private tomb, a luxurious extravagance for a small family that happened to like scarpa and was able to afford him. modena is a public cemetery, so public that actually the older cemetery requires a fee to access it while rossi’s project is open to the public [or at least that is what i decided upon finding the door open and no sign]. wandering through brion, the intense materiality of grass, concrete, water, keeps life around you. in modena, we are always in the home of the dead: in fact, when i visited on a hot italian sunday afternoon, the dead seemed to be following me, counting my footsteps and patiently waiting for me to leave. perhaps it was the loud plastic flowers, or the silent black and white photographs on every tomb, but the dead are always present in modena. in brion, they are part of the archeological fiction that scarpa has woven for us.